PHOTO CAPTION: Twins Brielle and Kyrie Jackson who made headlines. Twins Brielle and Kyrie Jackson of Westminster, Massachusetts, made national headlines five years ago due to the rapid recovery of one of the twins. Brielle, not yet a month old and weighing only two pounds at birth, was slowing getting weaker and in danger of dying. Nothing seemed to be working to help her recovery. Her twin Kyrie, three ounces heavier, was doing much better. As Brielle's condition got worse, nurse Gayle Kasparian remembered a techinque she had heard about called "double bedding" where in multiple births the babies are put in the same crib. 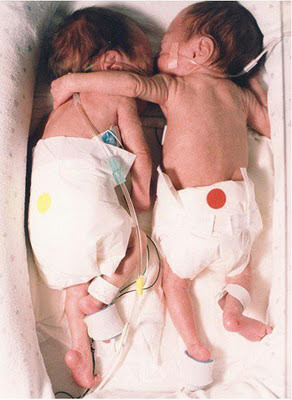 She placed Kyrie in the same incubator and the recovery of her twin amazed doctors and everyone. Kyrie snuggled next to her and the improvement was instant. The two went on to thrive and do well. In the book Twin Tales: The Magic and Mystery of Multiple Births Mrs. Jackson talks about the moment they were put together. She states, "We couldn't believe it - her whole body loosened up, her muscles relaxed, and her blood oxygen level went right up to 100 percent saturation, where it was supposed to be!" In the book it states that the twins went home a week before Christmas and received a wooden crib that they would go on to share. It says that they went on to do well as infants and toddlers and has some updated photos of the two. To read the full story of their birth click here. Check out a similar story here on preemies.